Cardinia Shire’s inaugural youth council members are looking forward to influencing decisions on their future. 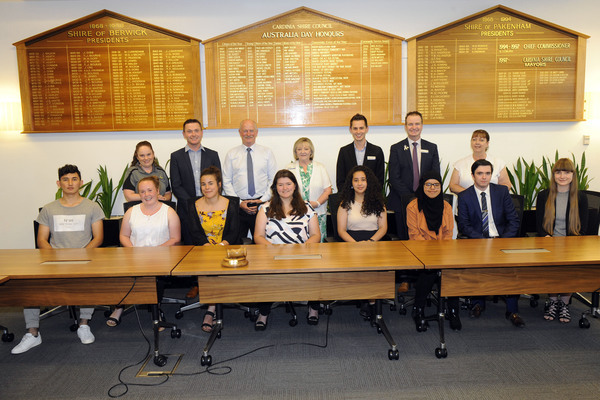 The nine young people, ranging from 15 to 20, were selected from a pool of 24 applicants by the shire to drive the program, aimed at giving youth a voice in their community and promoting leadership. The inaugural members are 2017 Cardinia Shire Young Citizen of the Year Emily Bloxidge, Kurt Caddy, Prachi Beniwal, Kiara Venturi, Mehdi Ahmadi, Joe Barratt, Amy Gregorovich, Hajar El-Hennawi and Jennifer James. Emily said she was excited to hearing the different views put forward by the group, who came from a range of cultures and backgrounds. “I’m looking forwarding to seeing how our passions differ. I think (the age group of) 15- 20 is a good spectrum to represent young people,” Emily said. For Emily, her focus will be on activating more opportunities for local youth. “What is it kids can do to help? Volunteering is not just in a group setting and for younger people it’s not always about following an organisation such as Scouts. It could be as simple as helping out a neighbour,” Emily said. The 2017 Cardinia Shire Young Citizen of the Year said she was most excited about being part of something “cool” that could influence the future. “I love the dynamics, that you can drive change, not necessarily for yourself, but for generations to come,” Emily said. The group will hold their first meeting in February.